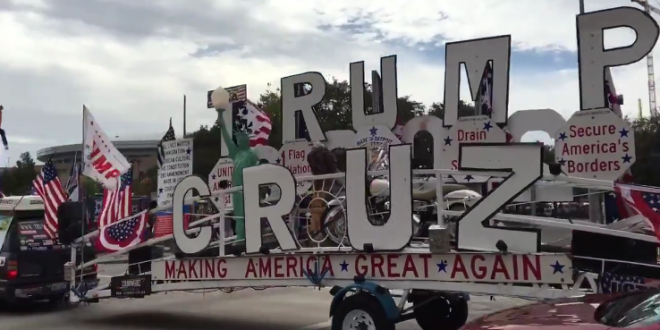 Thousands Gather For Trump/Cruz Tailgater [VIDEO] - Joe.My.God. The “amoral bully” is ready to campaign for the “dishonest politician” as President Donald Trump holds a Houston rally for Sen. Ted Cruz on Monday. The president’s appearance on behalf of Cruz represents a once-unthinkable show of support for Trump’s onetime rival for the 2016 Republican presidential nomination and comes as Cruz faces a strong challenge from Democratic Rep. Beto O’Rourke. Closing in on Election Day, Trump tweeted Monday morning: “Big Night In Texas!!! !” In recent weeks, Trump has attacked O’Rourke on Twitter as a “total lightweight” and a “flake,” while stressing that Cruz “has long had my Strong Endorsement.” That’s a far cry from Trump’s derision of Cruz as “Lyin’ Ted” during the 2016 primaries, when the two traded unusually harsh words for each other. A number that started off as hundreds has now swelled to thousands of President Trump supporters waiting outside the Toyota Center to see the president at his “Make America Great Again” rally later today. The Trump re-election team that’s organizing the events reports they’ve had 100,000 requests for tickets as of Sunday afternoon. The Toyota Center holds about 18,000 people. So far, it doesn’t appear that any protesters have showed up to the event. People are excited, but things have remained calm. A large police presence is also around the area. You may want to avoid going downtown today if you don’t have to be there. For those unable to get inside the Toyota Center, the Trump campaign is throwing a tailgate party outside. That arena seats 18,000. Cruz, working to fend off El Paso Rep. Beto O’Rourke, welcomes the help from Donald Trump–an ally for the last two years, after an unusually bitter rivalry during the 2016 presidential primaries. “We’ve worked together very closely. Once he was elected president, we had an opportunity, an opportunity to do historic good for the country, for the state of Texas,” Cruz said during a campaign stop in his hometown of Houston on Sunday. NOW: Crowds gather ahead of President Trump’s ‘Make America Great Again’ rally and tailgate party in Houston — the rally is scheduled to start at 7:30 p.m.